SAN FRANCISCO (AP) — Winter weather enveloping California’s mountains for a fourth straight day Friday kept skiers from hitting the slopes at the start of the Presidents Day holiday weekend, with snow so deep that plows could not tackle it and cities scrambled to find places to pile it. Several routes to the ski mecca of Lake Tahoe shut down, including about 70 miles (110 kilometers) of Interstate 80 from Colfax, California, to the Nevada state line. I-80 was reopened to passenger vehicles Friday evening. Chains were required for travel in many other parts of the towering Sierra Nevada. “All avid skiers are itching to get out on the mountain, but the roads are pretty treacherous right now,” said Kevin Cooper, marketing director for Lake Tahoe TV. The storm was expected to dump between 3 and 6 feet (1 to 2 meters) of fresh snow in a region where some ski resorts reported getting 3 feet (1 meter) since Thursday. Officials warned of avalanches in the greater Lake Tahoe Area, where heavy snow and high winds were expected through Sunday. Storms also have swamped much of the state with heavy rain that crumbled roads and flooded a resort north of San Francisco where a kayaker paddled through a meeting room after a nearby river swelled over its banks. The onslaught extended into Arizona and other parts of the U.S. West, with a winter blast also hitting Missouri. In California, the heavy snow forced some skiers to cancel their plans. Aura Campa of Oakland and her partner were hoping to take advantage of their season passes and the fresh powder at Squaw Valley-Alpine Meadows resort, but a near-accident on an icy road last weekend made them reconsider. When a main highway through the Lake Tahoe area was crushed with traffic, she drove her SUV on a side road. Her vehicle didn’t have chains, and when it was going uphill, the vehicle went into reverse. Authorities told people to stay home as snow kept piling up. “State Route 267 is so deep that plows can no longer plow. They have ordered up a large blower to try and clear the pass,” Placer County sheriff’s Lt. Andrew Scott said in a tweet with a video of the snow-covered road. About 140 miles (225 kilometers) southeast of Lake Tahoe, Mammoth Mountain was about to break a more than 30-year record for monthly snowfall, resort spokesman Justin Romano said. Skiers and snowboarders should be able to reach the slopes as long as they have chains or snow tires, he said. The resort has already gotten 163 inches (414 centimeters) of snow this month, just 5 inches shy of its snowfall record for February, set in 1986. 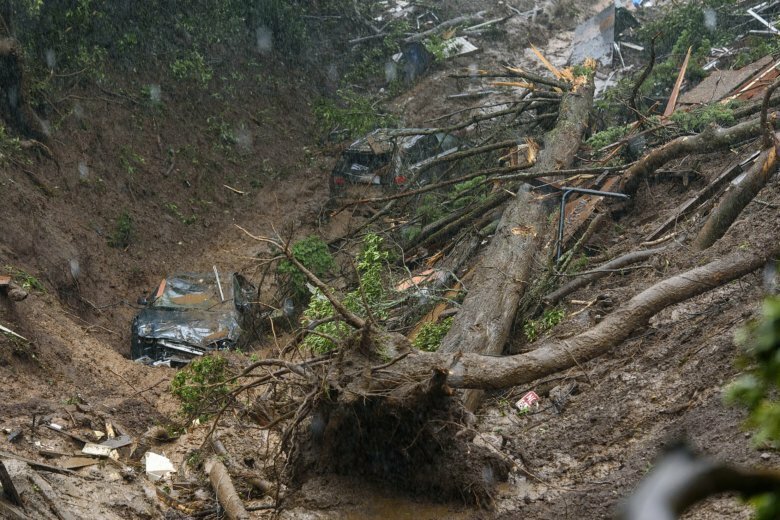 The storms heavily damaged — and in some places destroyed — parts of roads leading to Idyllwild and other mountain communities about 100 miles (161 kilometers) east of Los Angeles, but access was not cut off. Crews were starting repairs on State Routes 74 and 243. A route combining surviving portions of the two mountain highways and a county road kept the communities connected to the world, but authorities urged outsiders to leave the tenuous route to residents. “We’re discouraging tourism and snow play up there this weekend,” California Department of Transportation spokeswoman Terri Kasinga said. Highways also were damaged in the nearby San Bernardino Mountains, where ski resorts around Big Bear Lake have an abundance of snow. Kasinga said those routes would be open to the public. In other parts of California, crews turned to cleanup after a storm Thursday led to at least three deaths. A woman pulled from rising water in a flood-control channel in Corona, southeast of Los Angeles, had a heart attack and died. About 50 miles (80 kilometers) east, a man was found dead after floodwaters swept him away in a rural community. A man’s body also was recovered from a fast-flowing creek in Escondido, northeast of San Diego. Winter weather extended into Arizona and the Rocky Mountains. Firefighters rescued a motorist who called 911 to report that runoff swept his car down a wash in Tucson, Arizona. In northern Arizona, a handful of popular recreation areas around the red-rock resort town of Sedona closed because of heavy flooding. More storms were expected to drop snow in northern Arizona this weekend. In parts of Colorado, Montana and Wyoming, road crews worked to clear avalanches that had closed mountain highways and to ease the threat of more slides. Antczak reported from Los Angeles. Associated Press writers Daisy Nguyen in San Francisco; Amanda Lee Myers in Los Angeles; Felicia Fonseca in Flagstaff, Arizona; Paul Davenport in Phoenix; and Bob Moen in Cheyenne, Wyoming, contributed to this report.